As a prodrug, adrafinil is metabolised – in the body – to modafinil, which is the primary metabolite of adrafinil [3,4]. It is metabolised in the liver . 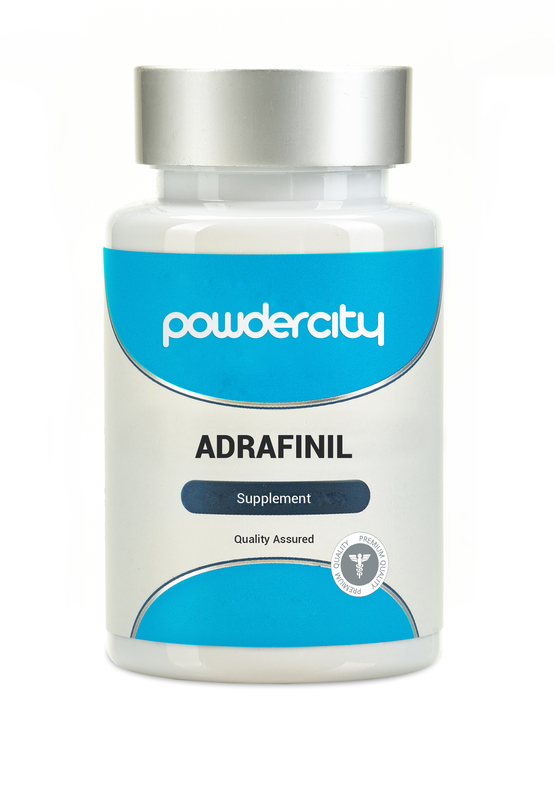 Adrafinil can counter problems associated with vigilance, attention, concentration, learning, memory and depressive manifestations . Adrafinil is very similar to modafinil and Armodafinil , and increases alertness minus the addictive nature, having minimal impact on sleep structure . Modafinil is a psychostimulant  with effects similar to adrafinil – alertness, mitigating fatigue. Modafinil’s half-life has been described as ranging from 12 – 15 hours . Modafinil may modify areas of the brain involved in regulating the sleep/wake cycle . Prior research shows modafinil on hypersomnia and narcolepsy showed that it significantly reduced the number of drowsiness and sleep episodes during the day . Standard therapeutic dose of modafinil, in adult patients, has been described as a daily dose of between 200-400mg . Figure 4a. The structures of both Modafinil (left) and adrafinil (right). Both psychostimulants have been suggested to be effective treatments for ADHD and opioid-induced sedation . Phenibut, or 3-phenyl-4-aminobutyric acid, is a psychotropic drug that carries nootropic properties, and is widely used as a mood elevator and tranquilizer . Side effects from phenibut intoxication – which can occur from as little as 3g daily over 4 days, to a 30g single dose – include lethargic altered mental status, muscle ‘spasms’, described as dystonia, and, hyperthermia . Adderall is a commonly abused prescription drug among college students , and is used for the treatment of ADHD . For this reason, Adderall has been listed as a Schedule II substance by the Drug Enforcement Administration (DEA). Adrafinil, in memory, concentration, learning, along with depressive manifestations is dose-dependent . Similarly, Modafinil has been reported as having a low level of toxicity: higher than 1g/kg, and around 400mg/kg in canines . A 20mg/kg dose in Beagle dogs was shown to enhance cognition in non-human subjects . In measuring locomotor activity in ages canines, Adrafinil at doses between 20-40mg/kg reliably increased over a month of daily treatment . Results from animal studies looking at how long Adrafinil lasts in the ‘system’ shows a gradual decline of Adrafinil (metabolism) at around ~10-12 hours. In the US, adrafinil has not been FDA approved. Adrafinil is prescribed in the treatment of narcolepsy. In 2004, The World Anti-Doping Agency announced and implemented adrafinil to its list of substances prohibited for athletic competition . The use of Adrafinil and Modafinil are banned in sports; stipulated by the WADA from their Central Nervous System stimulating effects . Norton W. Milgram, Heather Callahan and Christina Siwak, 1999. Adrafinil: A Novel Vigilance Promoting Agent. Christina T. Swiak, Heather Callahan and Norton W. Milgram, 2000. Adrafinil: Effects on Behaviour and Cognition in Aged Canines. Geraldine Dowling, Pierce V. Kavanagh, Brian Talbot, John O’Brien, Gary Hessman, Gavin McLaughlin, Brendan Twamley, and Simon D. Brandt, 2016. Outsmarted by nootropics? An investigation into the thermal degradation of modafinil, modafinic acid, adrafinil, CRL-40,940 and CRL-40,941 in the GC injector: formation of 1,1,2,2-tetraphenylethane and its tetra fluoro analog. Drug Testing and Analysis. K. Deventer, K. Roels, F.T Delbeke, P. Van Eenoo, 2011. Prevelance of legal and illegal stimulating agents in sports. Dongsoo Kim, 2012. Practical Use and Risk of Modafinil, A Novel Waking drug. Helene Bastuji and Michel Jouvet, 1988. Successful Treatment of Idiopathic Hypersomnia and Narcolepsy with Modafinil. Antonio Osorio-Lozada, Thomas Prisinzano and Horacio F. Olivo, 2004. Synthesis and determination of the absolute stereochemistry of the enantiomers of adrafinil and modafinil. Solveiga Grinberga, Liga Zvejniece, Edgars Liepinsh, Maija Dambrova and Osvalds Pugovics, 2008. Quantitative analysis of phenibut in rat brain tissue extracts by liquid chromatography-tandem mass spectrometry. Seth Sankary, Peter Canino, Jennifer Jackson, 2016. Phenibut Overdose. American Journal of Emergency Medicine. Carl L Hansen, Scott H. Burton, Christophe Giraud-Carrier, Josh H. West, Michael D. Barnes, and Bret Hansen, 2013. Tweaking and Tweeting: Exploring Twitter for Nonmedical Use of a Psychostimulant Drug (Adderall) Among College Students. Rohini R. Vanga, Bikram Bal, and Kevin W. Olden, 2013. Adderall Induced Acute Liver Injury: A Rare Case and Review of the Literature. R. Nageswara Rao, Dhananjay D. Shinde, M.V.N. Kumar Talluri, Sachin B. Agawane, 2008. LC-ESI-MS determination and pharmacokinetics of adrafinil in rats. Norton W. Milgram, Christina T. Swiak, Philippe Gruet, Patricia Atkinson, Frederique Woehrle and Heather Callahan, 2000. Oral Administration of Adrafinil Improves Discrimination Learning in Aged Beagle Dogs. Dubey S, Ahi S, Beotra A, Reddy IM, Kaur T, Jain S, 2008. A novel study of mass spectrometric fragmentation of adrafinil, modafinil and their metabolite modafilinic acid under ESI-LC-MS/MS and EI-GC-MS.